Archie’s address, phone, website, and more. 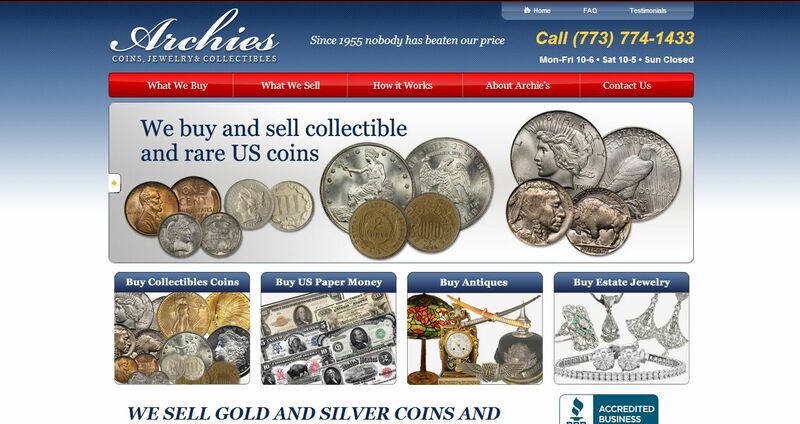 In 1955 Archie’s opened at 5516 W. Devon Ave., on Chicago’s far northwest side and word spread quickly that this was the place for the best prices when buying and selling antiques, rare coins and other valuables. 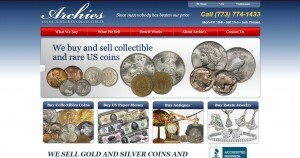 Over time we expanded our business and now Archie’s is the foremost dealer in the buying of scrap Gold, Silver and Platinum, rare US Currency and Coins, Gold and Silver Coins from around the world, Gold Bullion, Gold Bars and much more. We are a Numismatic Coin Dealer, and member of the PCGS & NGC. With over 50 years experience, our professional staff provides fair and accurate appraisals, and Archie’s has come to earn a reputation among jewelers, antique dealers and collectors from throughout Northeast Illinois and beyond for making top dollar deals. Jewelers, antique dealers and investors know and trust the professionals at Archie’s to provide accurate appraisals; the word is out – throughout Chicagoland nobody makes better deals. Archie’s pays more than pawnshops, hotel buyers and at home parties. We even buy from dealers. Archie’s also sells to dealers and collectors. Knowledgeable and experienced collectors know that Archie’s is the place to find rare and valuable items. Investors looking to add Gold to their IRAs come to Archie’s because they know we can offer them quantities of Bullion, Gold Bars and more.